Whey Protein Concentrate, Milk Protein Isolate, Whey Protein Isolate, Whey Protein Hydrolisate, Micellar Casein, Egg Albumin, Calcium Caseinate, L-Glycine, L-Leucine, L-Isoleucine, L-Valine, Sunflower Oil Powder and/or Soy Oil Powder, MCT Oil Powder [from Coconut], Creatine Monohydrate, Betaine Anhydrous, Dutch Cocoa Powder, Ibiza Cookie Crumbs [Enriched Flour (Wheat flour, niacin, reduced iron, thiamine mononitrate, riboflavin, folic acid), Sugar, Cocoa Powder, Soy Bean and/or Palm Oils, Corn Syrup, Chocolate Liquor, Salt, Corn Flour, Dextrose, Sodium Bicarbonate, Soy Lecithin], Glucose Polymers, Inulin, Xantham Gum, Cellulose Gum, Carrageenan), Natural and Artificial Flavors, Sea Salt, Caramel Color, Acesulfame Potassium, Sucralose. Take 1-2 scoops with 4-6 oz. (per scoop) of cold water or your favorite beverage. Vary the amount of your chosen liquid to acquire your desired flavor and consistency. Drink 1-4 servings daily, including after your workout to achieve your bodybuilding and fitness goals. To further increase protein intake and to create a milkshake-like consistency, try adding fat-free or low-fat milk in place of water. Before taking PRO-ANTIUM or any dietary supplement seek advice from your physician if you are unaware of your current health condition, have any pre-existing medical condition(s), taking any medication(s), planning any medical procedure, pregnant, nursing or contemplating pregnancy. Reduce or discontinue use if you have any adverse reactions such as but not limited to gastrointestinal irritation. PRO-ANTIUM is only intended to be used by healthy adults 18 years of age and older. Keep out of reach of children and pets. Whey Protein Concentrate, Milk Protein Isolate, Whey Protein Isolate, Whey Protein Hydrolisate, Micellar Casein, Egg Albumin, Calcium Caseinate, L-Glycine, L-Leucine, L-Isoleucine, L-Valine, Sunflower Oil Powder and/or Soy Oil Powder, MCT Oil Powder [from coconut], Creatine Monohydrate, Betaine Anhydrous, Copenhagen Cookie Crumbs [enriched flour (wheat flour niacin, reduced iron, thiamine mononitrate, riboflavin, folic acid), sugar, soy bean and/or palm oils, corn syrup, salt, vanilla], Glucose Polymers, Inulin, Xantham Gum, Cellulose Gum, Carrageenan, Natural and Artificial Flavors, Citric Acid, Sea Salt, Acesulfame Potassium, Sucralose FD&C Red #40. Recommended Use For Males: Take 1-2 scoops with 4-6 oz. (per scoop) of cold water or your favorite beverage. Vary the amount of your chosen liquid to acquire your desired flavor and consistency. Drink 1-4 servings daily, including after your workout to achieve your bodybuilding and fitness goals. To further increase protein intake and to create a milkshake-like consistency, try adding fat-free or low-fat milk in place of water. Recommended Use For Females: Take 1 scoop with 4-6 oz. of cold water or your favorite beverage. Vary the amount of your chosen liquid to acquire your desired flavor and consistency. Drink 1-4 servings daily to aid in your varying fitness goals. To further increase protein intake and to create a milkshake-like consistency, try adding fat-free or low-fat milk in place of water. KEEP OUT OF REACH OF CHILDREN. CAUTION: READ ENTIRE LABEL BEFORE CONSUMING. Before taking PRO-ANTIUM or any dietary supplement seek advice from your physician if you are unaware of your current health condition, have any pre-existing medical condition(s), taking any medication(s), planning any medical procedure, pregnant, nursing or contemplating pregnancy. Reduce or discontinue use if you have any adverse reactions such as but not limited to gastrointestinal irritation. PRO-ANTIUM is only intended to be used by healthy adults 18 years of age and older. Keep out of reach of children and pets. Warning: Manufactured on equipment which processes products containing milk, egg, soybeans, shellfish, wheat, and tree nuts. Whey Protein Concentrate, Milk Protein Isolate, Whey Protein Isolate, Whey Protein Hydrolisate, Micellar Casein, Egg Albumin, Calcium Caseinate, L-Glycine, L-Leucine, L-Isoleucine, L-Valine, Sunflower Oil Powder and/or Soy Oil Powder, MCT Oil Powder [from Coconut], Creatine Monohydrate, Betaine Anhydrous, Copenhagen Cookie Crumbs [Enriched Flour (Wheat flour, niacin, reduced iron, thiamine mononitrate, riboflavin, folic acid), Sugar, Soy Bean and/or Palm Oils, Corn Syrup, Salt, Vanilla], Glucose Polymers, Inulin, Xanthan Gum, Cellulose Gum, Carrageenan, Natural and Artificial Flavors, Sea Salt, Acesulfame Potassium, Sucralose. Protein Complex (Whey Protein Concentrate, Milk Protein Isolate, Calcium Caseinate, Whey Protein Isolate, Micellar Casein, & Egg White Albumin), Cocoa Powder, Chocolate Cookie Crumbs (Rice Flour, Sugar, Tapioca Starch, Palm Oil, Cocoa Processed With Alkali, Corn Starch, Salt, Chocolate Liquor, Natural Flavor, Sodium Bicarbonate, & Soy Lecithin), Natural and Artificial Flavors, Gum Blend (Cellulose, Xanthan, & Carrageenan), Non Dairy Creamer (Maltodextrin, Sunflower Oil, Sodium Caseinate, Tricalcium Phosphate, Mono and Diglycerides, & Natural Tocopherols), Enzyme Blend (Protease, Amylase, & Lactase), Flour, Salt, Sucralose, & Acesulfame Potassium. Take 1 scoop with 6-8 oz. of cold water or your favorite beverage. Vary the amount of your chosen liquid to acquire your desired flavor and consistency. Drink as needed including after your workout to acheive your bodybuilding and fitness goals. To further increase protein intake and to create a milkshake-like consistency, try adding fat-free or low-fat milk in place of water. Use in conjuction with a proper diet and exercise regimen to maximize results. KEEP OUT OF REACH OF CHILDREN. Must be 18 years old or older to purchase and/or use this product. Before taking PRO-ANTIUM® or any dietary supplement seek advice from your physician if you are unaware of your current health condition, have any pre-existing medical condition(s), taking any medication(s), planning any medical procedure, pregant, nursing or contemplating pregnancy. This product contains chemicals known to the State of California to cause cancer and/or birth defects or other reproductive harm. Reduce or discontinue use if you have any adverse reactions such as but not limited to gastrointestinal irritation. Keep out of reach of children and pets. Store in a cool, dry place. Protect from heat, light and moisture. ALLERGEN WARNING: CONTAINS INGREDIENTS FROM MILK, EGG, SOY AND PEANUTS. Made in facility that also processes wheat, peanuts, tree nuts, fish and crustaceans/shellfish products. Protein Complex (Whey Protein Concentrate, Milk Protein Isolate, Calcium Caseinate, Whey Protein Isolate, Micellar Casein, & Egg White Albumin), Cocoa Powder, Chocolate Cookie Crumbs (Rice Flour, Sugar, Tapioca Starch, Palm Oil, Cocoa Processed With Alkali, Corn Starch, Salt, Chocolate Liquor, Natural Flavor, Sodium Bicarbonate, & Soy Lecithin), Natural And Artificial Flavors, Gum Blend (Cellulose, Xanthan, & Carrageenan), Non Dairy Creamer (Maltodextrin, Sunflower Oil, Sodium Caseinate, Tricalcium Phosphate, Mono and Diglycerides, Natural Tocopherols), Enzyme Blend (Protease, Amylase, & Lactase), Flour, Salt, Sucralose, & Acesulfame Potassium. ALLERGEN WARNING: CONTAINS INGREDIENTS FROM MILK, EGG, WHEAT, AND SOY. Made in facility that also processes peanuts, tree nuts, fish and crustaceans/shellfish products. Protein Complex (Whey Protein Concentrate, Milk Protein Isolate, Calcium Caseinate, Whey Protein Isolate, Micellar Casein, & Egg White Albumin), Maltodextrin, Natural and Artificial Flavors, Gum Blend (Cellulose, Xanthan, Carrageenan, & Dextrose), Flour, Salt, Sucralose, Acesulfame Potassium, Creamer (Sunflower Oil, Maltodextrin, Sodium Caseinate, Mono and Diglycerides, Natural Tocopherols, & Tricalcium Phosphate), Enzyme Blend (Protease, Amylase, & Lactase), & Soy Lecithin (as an emulsifier). Protein Complex (Whey Protein Concentrate, Milk Protein Isolate, Calcium Caseinate, Whey Protein Isolate, Micellar Casein, & Egg White Albumin), Cookie Crumbs (Enriched Flour (Wheat Flour, Niacin, Reduced Iron, Thiamine Mononitrate, Riboflavin, & Folic Acid), Sugar, Soybean Oil, and/or Palm Oils, Corn Syrup, Salt, & Vanilla), Maltodextrin, Gum Blend (Cellulose, Xanthan, & Carrageenan), Natural and Artificial Flavors, Citric Acid, Non Dairy Creamer (Maltodextrin, Sunflower Oil, Sodium Caseinate, Tricalcium Phosphate, Mono and Diglycerides, Natural Tocopherols), Enzyme Blend (Protease, Amylase, & Lactase), Inulin, Flour, Salt, Sucralose, Acesulfame Potassium, & FD&C Red 40. Protein Complex (Whey Protein Concentrate, Milk Protein Isolate, Calcium Caseinate, Whey Protein Isolate, Micellar Casein, & Egg White Albumin), Cookie Crumbs (Enriched Flour (Wheat Flour, Niacin, Reduced Iron, Thiamine Mononitrate, Riboflavin, & Folic Acid), Sugar, Soybean Oil, and/or Palm Oils, Corn Syrup, Salt, & Vanilla), Maltodextrin, Natural and Artificial Flavors, Gum Blend (Cellulose, Xanthan, & Carrageenan), Non Dairy Creamer (Maltodextrin, Sunflower Oil, Sodium Caseinate, Tricalcium Phosphate, Mono and Diglycerides, Natural Tocopherols), Enzyme Blend (Protease, Amylase, & Lactase), Flour, Salt, Sucralose, & Acesulfame Potassium. It's not often that you find a product that can help you rebuild muscles, recover from fatigue and be ready for another workout. 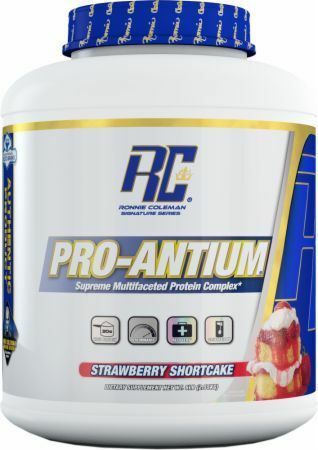 PRO-ANTIUM from the Ronnie Coleman Signature series fits the bill perfectly. Formulated by the 8 time (in a row!) Mr. Olympia winner Ronnie Coleman himself, it's guaranteed to increase your muscle mass to Mr. O ready proportions. Bodybuilders master the basics to good nutrition to achieve amazing muscle mass. Among all macronutrients, Protein is the most important. It's used extensively by the body to form literally everything from the hair on your head to your nails on your toes. It's also the number one ingredient that makes up your cells, especially muscle cells. That's right, Ronnie Coleman banks on this knowledge in his 20 year career in bodybuilding. His intake of quality protein helped him win 8 Mr. Olympia titles. It's only natural that he knows what's what with protein sources. Ronnie Coleman's protein intake is legendary, his diet contains the best protein sources and now he's bottling it up for you. Coleman is everything but standard. Have you seen the guy? He has some of the most impressive muscle mass on the planet. For sure, ordinary protein powders can't just make that kind of body. Coleman says so because he takes 29 grams of protein in one serving! Amazing right? 29 grams of protein might be too powerful, but if you're gunning for Coleman's physique, strength and muscular definition, PRO-ANTIUM is your choice. It's a protein mix from the man himself! In fact, Coleman makes supplements for athletes out of the stuff that he himself trusts and takes. And he's right about the protein content. If you really want to be on the top, you need the best source of protein to provide amino acids to create muscular tissue. The protein mix is packed with a lot of ingredients. PRO-ANTIUM contains a complex formula that will make your muscles tremble. You've got several sources of proteins in each serving. These have different absorption times which can give you a constant infusion of amino acids for a longer period of time. The sustained release of amino acids is the key to the success of PRO-ANTIUM as a protein supplement. Protein spikes in your body are useless as your kidney's eliminate them. Slow and steady, that's how your body can maximize on proteins. You also have branched chain amino acids (BCAA's) that act as backup to the protein matrix. BCAA's aren't used to create muscle cells, however, they perform hormone-like functions such as reducing fatigue levels and increasing muscular growth. 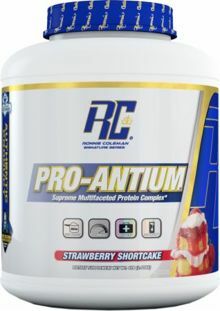 PRO-ANTIUM also has several vitamins and micronutrients in each serving. These vitamins perform anti oxidant functions as well as regulate energy consumption of your muscles. You can grab one protein source and brag all you want but in likelihood your protein supplement can't give you a complete list of essential and non essential amino acids. PRO-ANTIUM has these and more! With these on your side, you'll be able to train like Ronnie Coleman in no time! The guy knows how important protein is to athletes and professional bodybuilders so he knows what he's doing with PRO-ANTIUM. You can find it in your favorite supplement stores or at Ronnie Coleman's website. Lambert CP, Frank LL, Evans WJ., "Macronutrient considerations for the sport of bodybuilding." Lemon PW, Tarnopolsky MA, MacDougall JD, Atkinson SA., "Protein requirements and muscle mass/strength changes during intensive training in novice bodybuilders." Gualano AB, Bozza T, Lopes De Campos P, Roschel H, Dos Santos Costa A, Luiz Marquezi M, Benatti F, Herbert Lancha Junior A., "Branched-chain amino acids supplementation enhances exercise capacity and lipid oxidation during endurance exercise after muscle glycogen depletion." Bazzarre TL, Kleiner SM, Ainsworth BE., "Vitamin C intake and lipid profiles of competitive male and female bodybuilders."